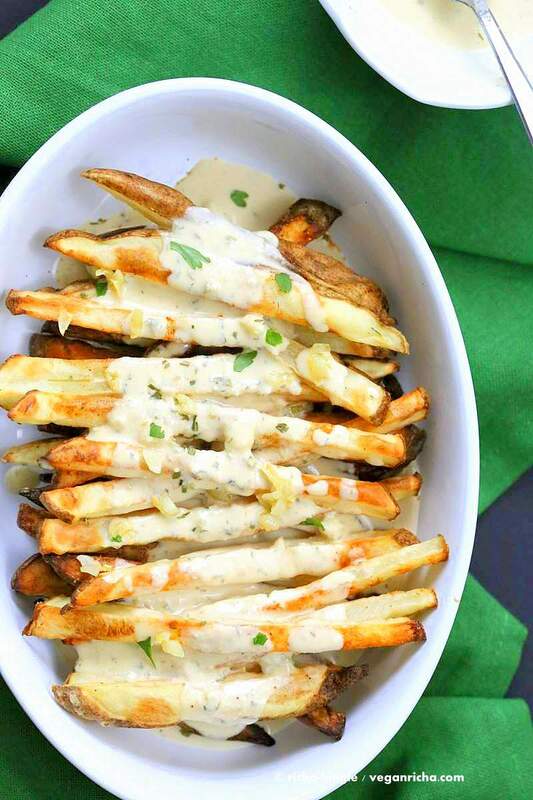 Baked Fries with Garlic Sauce and Oregano. 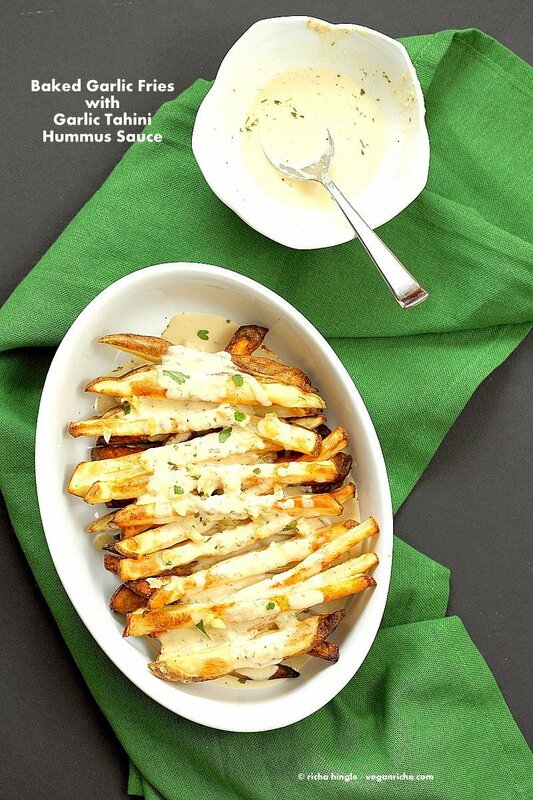 Baked potato wedges served with garlic hummus tahini Oregano sauce. These Garlic Fries are super addictive and just like the deep fried Mediterranean Garlic Fries. Add vegan feta if you like. Vegan Gluten-free Soy-free Snack Recipe. Pin this Recipe! Every time I am around Bellevue, I remember how much I like the food at Garlic crush and pick up a falafel sandwich and their garlic fries sans feta. They are fries, all fried, crisp and hot dripping with this garlicky tangy dressing. Its one of those once a while indulgence like fried Samosas. Most days we pick up the just fries for the road. I have no clue why I always get hungry as soon as I am in the car. Even if it is right after a heavy lunch. 5 Minutes into the drive, I will get an urge to munch. It probably runs in the family. Or so Mom says. I cannot imagine how she handled 3 constantly munching kids while driving them around :). I decided to so something about that craving with a baked version. I feel much happier eating this and my tummy thanks me too! for several reasons including homemade is always better/fresher. 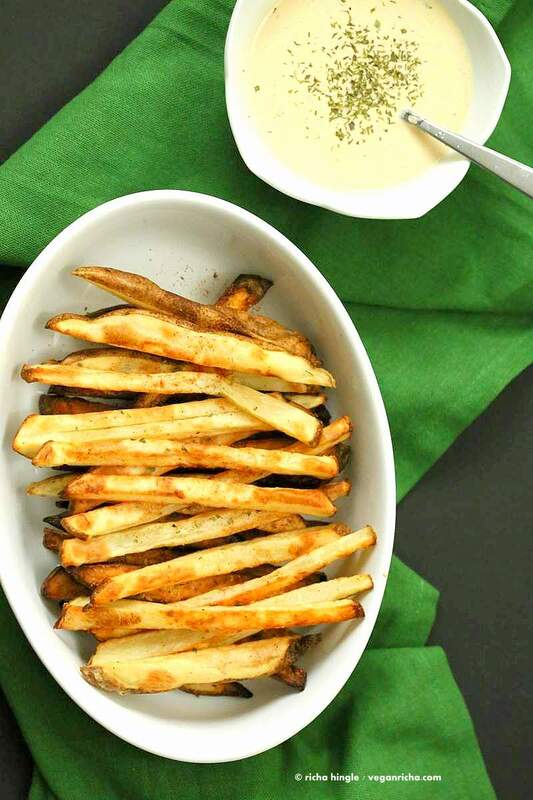 These baked garlic fries take just a few minutes to throw together. Chop up potatoes, toss in oil and bake. Cook some chopped garlic to golden. Blend the sauce + garlic and keep ready. Dress (the fries) and impress. For variation, use baked sweet potatoes or root vegetables. Cucumber Turmeric hummus sesame Mint bites. Thai Layered Dip -because Peanut sauce. Bake the potato, prep the sauce and garlic. 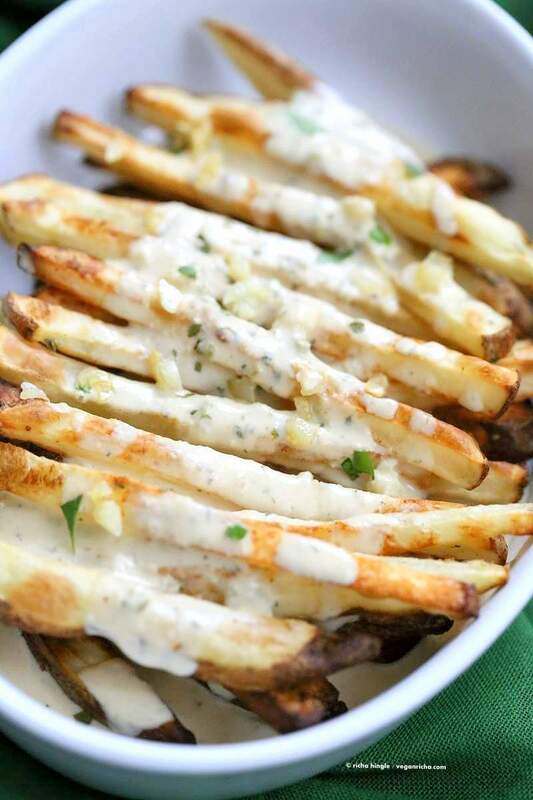 Dress liberally and serve these garlicky Baked Garlic Fries! Ignore the messy dressing bowl. These fries will do this to you. The urge to eat them all before the photos are done. Bake the fries: Preheat the oven to 425 degrees F / 220ºc. Chop the potatoes. Press a paper towel on the potatoes to absorb excess moisture if needed. In a large bowl, add the chopped potatoes and toss in flour/starch. Then add oil and mix in. Sprinkle will salt, pepper, garlic, oregano and mix in. Spread the potatoes on parchment lined baking sheet with atleast a 1/4 inch between them. *Parchment papers have oven safe temperature mentioned on them. Do not use parchment with temp rating lower than 425. Bake on a greased baking sheet instead. Bake for 15 minutes. Turn the sheet around and bake for another 5 to 10 minutes or until golden/golden brown on most edges. do not over bake to too much brown as the potatoes get bitter when burnt. . Meanwhile make the garlic tahini hummus sauce: In a small skillet heat oil over medium-low heat. Add chopped garlic and cook until translucent. Stir occasionally. Blend the rest of the sauce ingredients and half of the cooked garlic until smooth. Taste and adjust salt, tang (lemon juice) and garlic. To serve: Place a double layer of freshly baked fries in a serving container. Dress generously with garlic sauce. Sprinkle cooked garlic over the sauce. Garnish with chopped fresh oregano or parsley. Serve! For variation, use baked sweet potatoes or root vegetables. To make these oil-free: Use oven roasted garlic (roasted without oil). Omit the oil while baking the potato fries. Wow, these look REALLY delicious! these look perfect! you make the most beautiful food. Thank Caitlin! so happy to see you back! I love the falafel at Garlic Crush too (I live in Redmond), but never knew they had these delicious sounding fries! I must try them. Or better yet make them myself! I’m practically running to the kitchen to make these to go with dinner! That garlic sauce…wow! Can’t wait to try it out! I have been a bit absent lately, sorry… But these really look delicious. I’m making these as soon as possible. I’m have been on a bad cooking streak lately and that’s so annoying! I don’t know what is wrong with me but I seem to have lost my cooking skills or something. I know right. As soon as I am in the car, I need something. It happens sometimes, the streak will be back! There are days when nothing comes out right or is almost inedible and i just stop cooking for the day and try something which i know will work, and get back to the recipes that didnt work after a bunch of days. These potatoes look delicious! Can you use any type of potatoe? Russet or baking potatoes bake/taste best as baked fries. You can use other potatoes as well. Adjust the cooking time to bake longer or less depending on the potato. I made these tonight and they were delicious. I made falafel bites from the oh she glows cookbook to go with it and that actually was a great combination. How is it that you do everything so right?!!!! Yum ???? The cornflour tip is a simple one but makes these the best baked fries I’ve ever made. Yup, all that amazing crispyness! Just made this. Holy delicious! I just made these fries for lunch today and we had them as a side dish with no garlic sauce. They are amazingly tasty.Thank you so much for thia recipe! Wow! Just made these! They are delicious. I can think of a million other things to use this sauce on too !! Had these for a decadent lunch. So good! Hi there Richa…I was just wondering ..do u ever use an air fryer for recipes like this??? If so , have you tried with samosas, bhaji, pakora etc???? I dont have an airfryer yet 😉 so i havent tried it. but i am sure you can adjust the recipe to airfrying easily as these are just regular style baked potatoes. I also bake my samosa,s bhajjis and pakora (see my first book Indian kitchen). So you can use the airfryer for those too. Probably bake for a few minutes less, flip and move around, check them and bake again. I’ve been experimenting with my naturopath due to some health issues. It seems I will need to follow a mostly plant based diet that is low fat. I found your blog interesting b/c the recipes seem to fit in these categories. This was my first recipe I’ve made from your blog. I did use the oil in the potatoes, but left it out in the sauce since both hummus and tahini contain oil. I made this as a side dish along with some soy sloppy joe’s from Dr. McDougalls’ blog. Wowza, what a great meal! These fries are so flavorful and tasty! I did not make the baked garlic fries. But I did made the sauce to compliment some loaded potato skins. I don’t know what went wrong…. I followed the recipe to the exact measurements etc. I did roast the garlic, I found I needed to add lots more water. I found the sesame flavour very overpowering and quite unpleasant. I/We personally like the sauce or the consistency (which was so thick) not sure oregano and dill works either. i think it could be the tahini, Some tahini brands are thicker and stronger flavored. Tahini also seizes up when you mix it with water (over mixing). So then you would need more water. So the overall flavor balance might have changed. Thats ok that it didnt work. You dont have to love all flavor combinations i come up with :). I dont like everything i come up with either. Sometimes i am ready to bin it, but hubbs ends up loving it :). I would have used up the sauce and putting it in some falafel mixture (before baking or pan frying) as the garlic and sesame flavors work well with chickpeas. and the flavor would also distribute to be mild. Going forward…. I wish you a very happy upcoming New Year, and I look forward to your recipes in 2019. Hopefully, another cookbook eventually too….